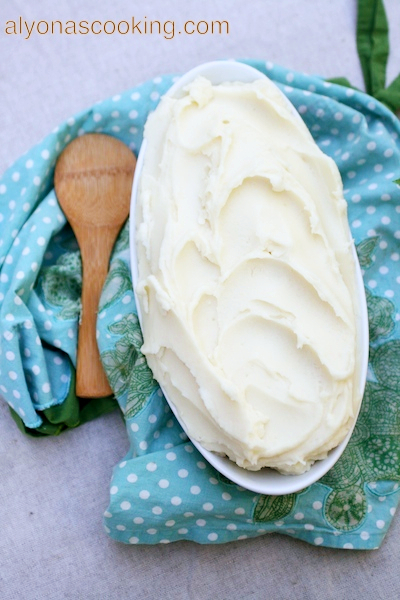 I know you’re probably thinking, why is she posting a mashed potato recipe…? You probably already have a favorite recipe, but I wanted to share my go to version. Perhaps you can change-up your recipe, if it’s a little different. After all it’s nice to get inspired, right? 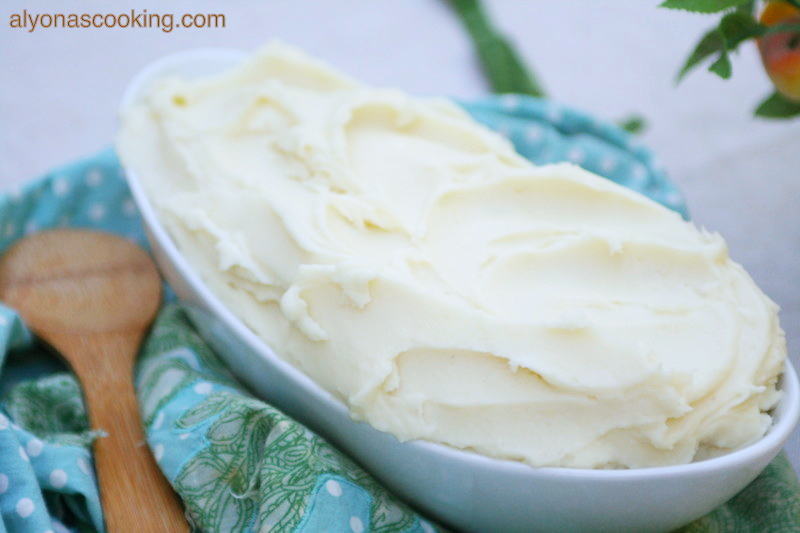 Not only is this my staple mashed potato recipe, but I’ve also included many helpful tips on how to get a perfect and lump free consistency. This recipe goes with almost anything not to mention it makes a great pieroge filling. Serve this with some Tender Pineapple BBQ Ribs and you have yourself one delicious hearty meal! This recipe is very basic and isn’t overpowering with a lot of different spices or ingredients. Now, don’t get me wrong, I do enjoy garlic mashed potatoes with steak seasoning, but this recipe is just a classic that I keep coming back to; because it’s just simple and delicious. Peel, wash and cut potatoes into large chunks. Throw into a large pot and cover with just enough water to cover potatoes. Bring potatoes to a boil; reduce heat to medium-high, and boil for 25 minutes. 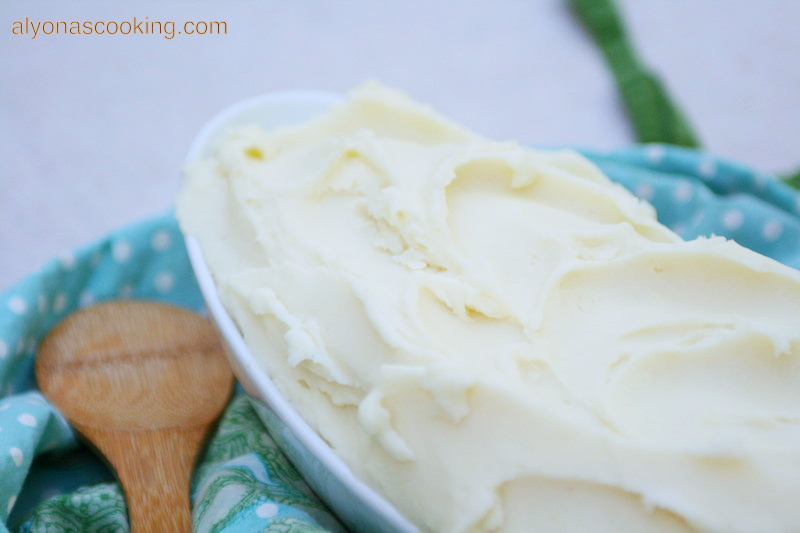 When potatoes are done boiling; drain and add 2 tbsp of sour cream, 4 oz of cream cheese and 6 tbsp of butter. Cover potatoes with a lid and allow potatoes to steam and the ingredients to melt (about 2 min.) Uncover and mix potatoes with a hand mixer directly in the pot. Mix until you see no more chunks, you may need to use a spatula to scrap the sides and bottom as there can be chunks hiding in some places. When potatoes are whipped throughly with a hand mixer you may ADD the LIQUID. First add milk (preferably warm) and mix until incorporated then add the half and half. You could substitute heavy cream for the half & half or use all milk, it’s completely up to you. Whip throughly until liquid is incorporated in the potatoes. Do not over mix after adding the liquid this could result in a starchy and sticky mashed potatoes. Which is why it’s very important to throughly beat the potatoes first before you add any liquid. Peel, wash and cut potatoes into large chunks Throw potatoes into a large pot and cover with just enough water to cover the potatoes. Bring potatoes to a boil; reduce heat to medium-high and boil for 25 minutes. Remove the lid and mix potatoes with a hand mixer directly in the pot. Mix until you see no more chunks, you may need to use a spatula to scrap the sides and bottom as there can be chunks hiding in some places. When potatoes are whipped throughly with a hand mixer you may add the liquid. First add milk (preferably warm) and mix until incorporated then add the half and half. Whip throughly until liquid is incorporated in the potatoes. I have decided to give my feedback on this recipe, because every time we make it, it comes out delicious. Thank you, this is the best mashed potatoes I have ever had!